Add all the ingredients to the water and heat with stirring to 80C. The mix is held at 80C for 30 minutes and then add the perfume, stir well to form a good emulsion and fill the containers. Mix all ingredients. Pasteurise and homogenise. Add chocolate flavour and colour as required. A kappa type carrageenan or furcellaran is the best for this recipe. A standard half fat chocolate milk. Complete stabilisation of the cocoa particles is affected by milk, cocoa and carrageenan types. Hydrocolloid manufacturers produce carrageenans specifically for chocolate milk (generally semirefined kappa carrageenan with specific viscosities). Cream cheese is a soft, white cheese which is mild in flavour. It is not normally matured which gives it a fresh, light taste. Its fat content is typically 30% although light versions are available which may be as low as 5% fat. A cream style salad dressing. While xanthan is very pH stable, guar is not as stable at low pH, therefore it is important to fully hydrate the guar prior to acid addition. This helps retain some functionality at lower pH. Tween 60 is a very effective emulsifier but it is not acceptable in all countries. Chefs make custard by combining milk (or cream), sugar, vanilla and egg yolk. Industrially it is made without the egg yolk (due to cost) and the yellow colour is obtained by the use of colours. The thickener can be reduced to make it a pouring sauce (like crème anglaise) or increased to make a pastry filling like crème pâtissière. A basic dessert jelly with carrageenan and locust bean gum. Mix gums with sugar and disperse into hot water. Add remaining ingredients. Stir until fully dissolved, pack off and pasteurise in the packets. Store at room temperature. In general, frozen yogurt contains less fat and more sugar and protein than ice-cream. Also an emulsifier is not always needed. The practical utility of carrageenan stems from two key properties. Its ability to form strong gels with certain salts or other gums and its ability to interact with certain dairy proteins. Carrageenan is mainly used in the food industry with some applications in the toiletries industry. Industrial applications of carrageenan are rare. Probably the best-known synergistic carrageenan interaction is that involving milk proteins. Some of the first uses of carrageenan were in milk gels and flans, and in the stabilisation of evaporated milk and ice cream mixes. 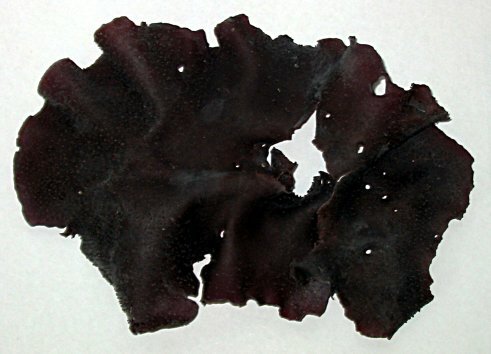 The 'original' carrageenan was Chondrus Crispus,a red seaweed found in the north Atlantic. Another name for this seaweed is 'Irish moss'; a name still used in the brewing industry. 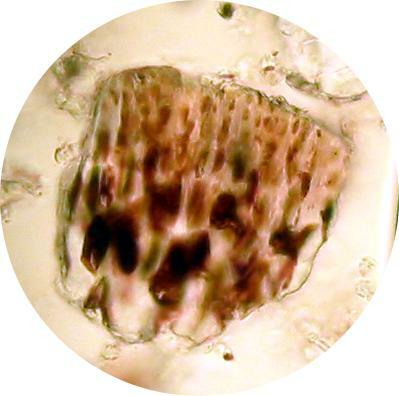 Chondrus crispusactually contains a mix of carrageenan types, the predominant ones being kappa and lambda. The basic structure of carrageenan is a linear polysaccharide made up of a repeating dissacharide sequence of α-D-galactopyranose linked 1,3 called the A residue and β-D-galactopyranose residues linked through positions 1,4 (B residues). Mixtures of hydrocolloids are commonly used to impart novel and improved rheological characteristics to food products and an added incentive is a reduction in costs. The nature of the synergy can be due to association of the different hydrocolloid molecules or to non-association. If the two hydrocolloids associate then precipitation or gelation can occur. Frankfurters can be made from pork, chicken, turkey, pork and beef or combinations of different meats. Meat analogue frankfurters are also available commercially. A basic petfood formulation for the meat in gel type of canned petfood. Disperse the carrageenan, salts and LBG in the water. Add the meat, mix, can and retort. A block type processed cheese suitable for pizza toppings and other shredded or sliced applications. 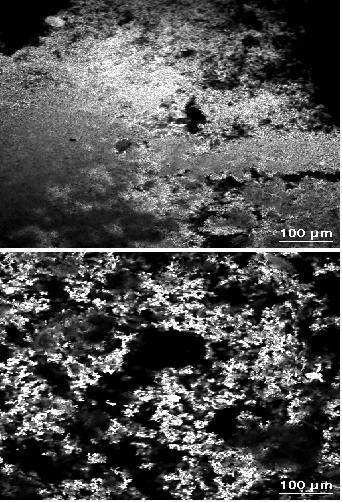 Micrographs from CSLM of 10% wt WPI gels in 24 mM CaCl2 (top) alone and (bottom) in the presence of 1% wt κ-carrageenan. White areas correspond to fluorescently-labelled protein. (top) shows a comparatively homogeneous network of agglomerated protein. A standard grade ice cream formulation with good melt down resistance and heat shock stability. The LBG and fat are the two main ingredients which increase the melting and heat shock resistance of the ice-cream. A standard tortenguss (German cake glaze, similar to nappage) recipe. A fruit glace will prevent fruit drying out and can enhance the appearance of cakes on display. Mix all ingredients together, stir with heating until you reach a low simmer. Simmer for one minute. Add colour and flavour as required. A 30% american style extended turkey breast. The phosphate needs to be dissolved in water first and without any other ingredients. If it is mixed with the salt, it will not go into solution which means a non-uniform brine, and it may also block the injector. Following cooking the carrageenan gels which enhances water binding and improves yields. A yogurt style salad dressing. While xanthan is very pH stable, guar is not as stable at low pH, therefore it is important to fully hydrate the guar prior to acid addition. This helps retain some functionality at lower pH. Tween 60 is a very effective emulsifier but it is not acceptable in all countries.